We were walking to the tube station on by Bank Junction and heard the crowd waiting for the torch get increasingly louder. We rushed down to the sidewalk and I managed to snap this shot of the torchbearer. It was an amazing, unexpected sight that I will remember forever. 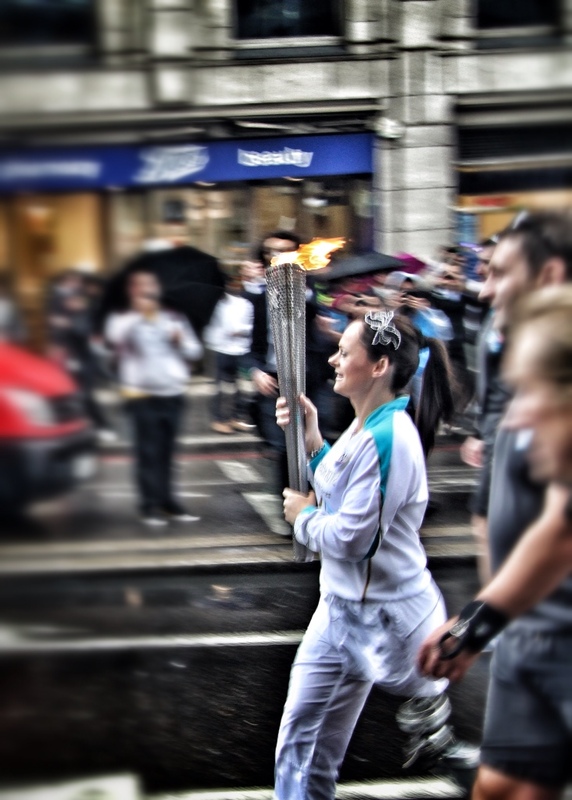 The energy of the crowd and the shining, symbolic light of the torch literally sent goosebumps down my back. What a great shot & LUCKY timing! Will you be able to make it to any events? Good thing I had my camera ready! I’m seeing the cycling on Saturday! Eric, What luck to see the torchbearer. And lunch look delicious. Will you meet up with Ed? Yes! We are meeting for dinner tomorrow and to watch the cycling on Saturday!